He trained as a chorister in the Chapel Royal and received an allowance from King George III to study at the Royal Academy Schools. He received commissions for royal portraits as early as 1785. These unusual circumstances led to the belief that he was the illegitimate son of the king. Further, in 1789 he was appointed Portrait Painter to the Prince of Wales (later George IV), becoming closely associated thereafter with the Prince’s set. He was elected to the Royal Academy and is represented in many British and American collections. 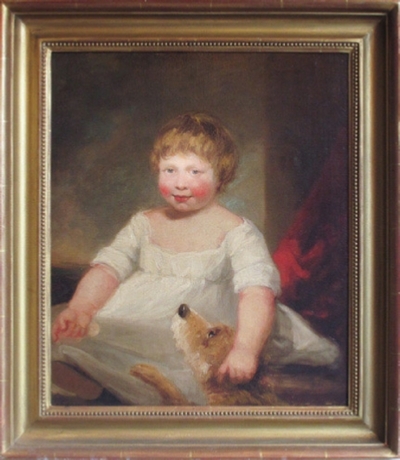 This charming portrait of a small boy with a dog cannot be attributed with certainty to Hoppner, though it illustrates many of the characteristics of his work. The background colouring is typical, the skilled simplicity of the dress appears in many of his works. So also is what is clearly an excellent facial likeness for which he was noted. Unfortunately, there is no associated provenance. It has, therefore, been attributed to Hoppner’s circle. It would date from around 1805. It is housed in a simple 19th century frame, not necessarily the original.